Some 15 Gabonese women traders have just acquired skills in the processing of perishable agricultural products. The training initiated by the NGO Women of Africa aims to limit food wastage and protect the environment through plastic recycling. Food products, such as vegetables, tubers and fruits, that rot, because they could not be sold, will become increasingly rare in Libreville’s garbage bins, because initiatives are multiplying to transform these perishable agricultural products. The last session was held on January 28, 2019. Some 15 women traders from the Charbonnages and Okala markets in the third district of Libreville benefited from a one-day training workshop on food preservation and the manufacture of processed products, including jams and cans. The objective is to avoid waste and losses, especially those due to unsold goods. “We are enabling these women to do their business differently. I had noticed that they dumped unsold food frequently. For these women who have a low capital, a low marginal income, throwing away food has become a problem for the survival of their business. Thanks to this activity, they have learned to transform them to waste less and make their business more profitable,” said Sandrine Itou-Y-Maganga, chairperson of Women of Africa, the NGO that initiated the training. This training is in addition to the similar training already undertaken since 2016 in Gabon by the Food and Agriculture Organization of the United Nations (FAO). According to the organisation, 1.3 billion tons of food products are wasted each year around the world. This large amount of food sent to the trash represents one third of all food produced on Earth. This is all the more appalling since, at the same time, 870 million people suffer from malnutrition and the production thrown away generates 8% of greenhouse gas emissions. Another module in the training of Gabonese women traders focused on environmental protection in their business. “They also needed to be introduced to the preservation of the environment through small actions. We don’t necessarily need to start with tons of wrapping, but we can start at a low level, through recycling and reusing what we use every day. This is what it means to put into practice the 3 Rs (reduce, recycle and reuse),” explains Juliette Bengone, head of training, who is also the chairperson of the NGO Youth and Environment. 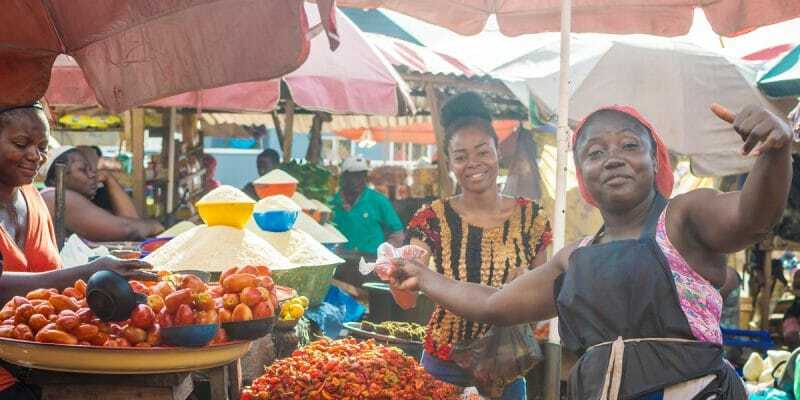 The implementation of the 3 Rs among Gabonese women traders is explained, insofar as the country is facing an invasion of public spaces by plastic waste. The high consumption of manufactured products, supported by population growth in Gabon’s major cities, the supply and massive use of plastic articles contribute to the unbridled production of plastic waste. The daily production of plastic waste is estimated at more than 250 tonnes, spread between Libreville and Port-Gentil.